Henge (> 20 m). The word henge refers to a particular type of earthwork of the Neolithic period, typically consisting of a roughly circular or oval-shaped bank with an internal ditch surrounding a central flat area of more than 20 m (66 ft) in diameter. There is typically little if any evidence of occupation in a henge, although they may contain ritual structures such as stone circles, timber circles and coves. Henge monument is sometimes used as a synonym for henge. Henges sometimes, but by no means always, featured stone or timber circles, and circle henge is sometimes used to describe these structures. The three largest stone circles in Britain (Avebury, the Great Circle at Stanton Drew stone circles and the Ring of Brodgar) are each in a henge. Examples of henges without significant internal monuments are the three henges of Thornborough Henges. Although having given its name to the word henge, Stonehenge is an atypical henge in that the ditch is outside the main earthwork bank. Hengiform monument (5 ≤ diameter ≤ 20 m). Like an ordinary henge except the central flat area is between 5 and 20 m (16–66 ft) in diameter, they comprise a modest earthwork with a fairly wide outer bank. Mini henge or Dorchester henge are sometimes used as synonyms for hengiform monument. An example is the Neolithic site at Wormy Hillock Henge. Efforts to provide a direct lineage for the henge from earlier enclosures have not been conclusive. Their chronological overlap with older structures makes it difficult to classify them as a coherent tradition. They seem to take the concept of creating a space separate from the outside world one step further than the causewayed enclosure, and they focus attention on an internal point. In some cases, the construction of the bank and ditch was a stage that followed other activity on the site. At Balfarg, North Mains and Cairnpapple, for example, earlier cremations and deliberate smashing of pottery predate the enclosure. Some scholars, such as the editors of the 1982 edition of the Penguin Dictionary of Archaeology (Bray and Trump, 1982), have claimed that henges are unique to the British Isles. They state that similar, much earlier, circles on the Continent, such as Goseck circle (which has no bank in any case), and later ones such as Goloring are not proper "henges". But The Penguin Archaeological Guide (Bahn, 2001) does not comment on geographical locations for henges. Excavated henge ditch on Wyke Down (Dorset). The ditch was originally dug as Causewayed enclosure and may therefore not be a henge. It has been suggested that the stone and timber structures sometimes built inside henges were used as solar declinometers to measure the position of the rising or setting sun. These structures by no means appear in all henges and often considerably post-date the henges. Thus they are not necessarily connected with the henge's original function. It has been conjectured that they could have been used to synchronize a calendar to the solar cycle for purposes of planting crops or timing religious rituals. Some henges have poles, stones or entrances that indicate the position of the rising or setting sun during the equinoxes and solstices, while others appear to frame certain constellations. Additionally, many are placed so that nearby hills either mark or do not interfere with such observations. Finally, some henges appear to be placed at particular latitudes. For example, a number are placed at a latitude of 55 degrees north, where the same two markers can indicate the rising and setting sun for both the spring and autumn equinoxes. But as henges are present from the extreme north to the extreme south of Britain, their latitude could not have been of great importance. Formalisation is commonly attributed to henges; indications of the builders' concerns in controlling the arrival at, entrance to, and movement within the enclosures. This was achieved through placing flanking stones or avenues at entrances of some henges, or by dividing up the internal space using timber circles. While some were the first monuments to be built in their areas, others were added to already important landscapes, especially the larger examples. 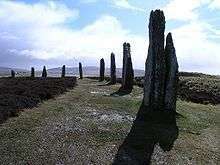 ↑ "Early Prehistoric Monuments - Henges". English Heritage. Retrieved 27 April 2013. ↑ "Early Prehistoric Monuments - Hengi-Form Monuments". English Heritage. Retrieved 27 April 2013. ↑ "Early Prehistoric Monuments - Henge Enclosure". English Heritage. Retrieved 27 April 2013. ↑ Leary, Jim; Clarke, Amanda; Bell, Martin (July 2016). "Valley of the henges". current archaeology. XXVII, No. 4 (316): 28 – 34. ↑ Anon. "Henge definition". dictionary.com. Dictionary.com LLC. Retrieved 4 September 2009. ↑ Rothwell, Henry. "Henges – or the archaeology of etymology (or vice versa); The man who gave us the word". Digital digging. Retrieved 4 September 2009. ↑ Pitts, Michael (2011). Hengeworld. Random House. p. 26–28. Stonehenge is not a henge. This bizarre contribution … was first used by … Thomas Kendrick. … Technically, [henges] are earthwork enclosures in which a ditch was dug to make a bank, which was thrown up on the outside edge of the ditch. ↑ Towrie, Sigurd. "The definition of a henge". Orkneyjar: The Heritage of the Orkney Islands. Sigurd Towrie. Retrieved 4 September 2009. 1 2 "Maumbury Rings". Visit Dorchester. Retrieved 14 April 2015. ↑ Cope, Julian (2004). The Megalithic European: The 21st Century Traveller in Prehistoric Europe. Harper Collins. ISBN 978-0-00-713802-9. Retrieved 4 September 2009. Burl, A. (1969) 'Henges: internal features and regional groups', Archaeological Journal, 126, pp. 1–28.